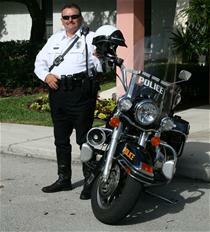 Officer Bruce St. Laurent was born in Fall River, Massachusetts in 1957 and has been a resident of Jupiter since 1973. Bruce has been married to his wife, Brenda, for over thirty years and has four children, Larry, Albert, Lenny, and Chartelle. On February 10, 1992, Officer St. Laurent began his career with the Jupiter Police Department. During his twenty years of service, Officer St. Laurent went above and beyond his normal duties as a Police Officer, leaving a positive impact on many people within our community. Officer St. Laurent demonstrated his commitment to his community by playing the role of Santa Clause during local holiday events. He always enjoyed helping young people and would assist students from Jupiter High School performing physics experiments related to speed measurement. In 1996, Officer St. Laurent also gave his time to assist in the construction of a Habitat for Humanity home in Jupiter. After helping build the home, he went even further and welcomed the new homeowners with a basketball hoop and basketball he had purchased just for them. The genuine kindness and generosity Officer St. Laurent has shown our community over the years did not go unnoticed. He has received countless thank you letters from citizens in the community and numerous letters of commendation. In 1993, 1996, and again in 2008, Officer St. Laurent was selected as the Jupiter Police Department’s Officer of the Quarter. Officer St. Laurent received the top award in 1996 when he was selected as the Officer of the Year. Bruce St. Laurent was a valued member of our community and employee within the Town of Jupiter. He was an amazing person who will be missed by everyone who was fortunate enough to know him.